It’s August—which means families are hitting the road for a final summertime fling before school starts. Over on TripAdvisor Wendy’s been sharing her tips for taking the kids to amusement parks and to zoos and aquariums, but here’s another idea for your family trip activities list: food factory tours. 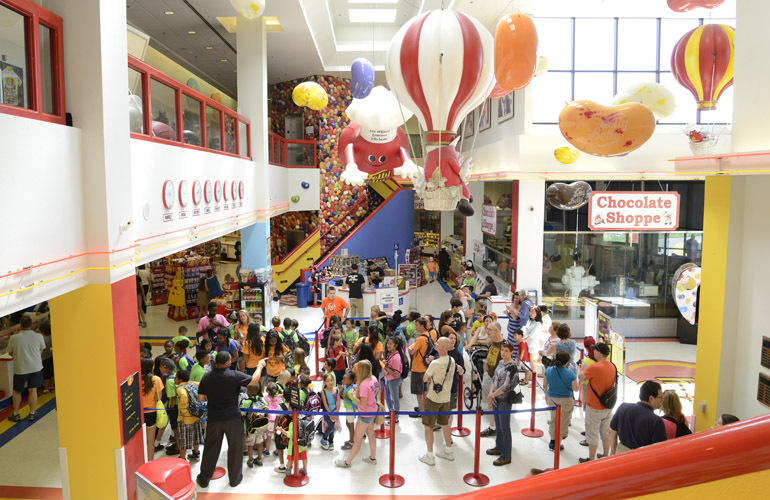 Many candy, ice cream, and food companies offer kid-friendly tours of their facilities. There are the well-known ones like Hershey’s Chocolate World in Pennsylvania and Ben & Jerry’s in Vermont, but you can find more unusual ones like Tabasco Pepper Sauce in Louisiana and the Celestial Seasonings Tea factory in Colorado. 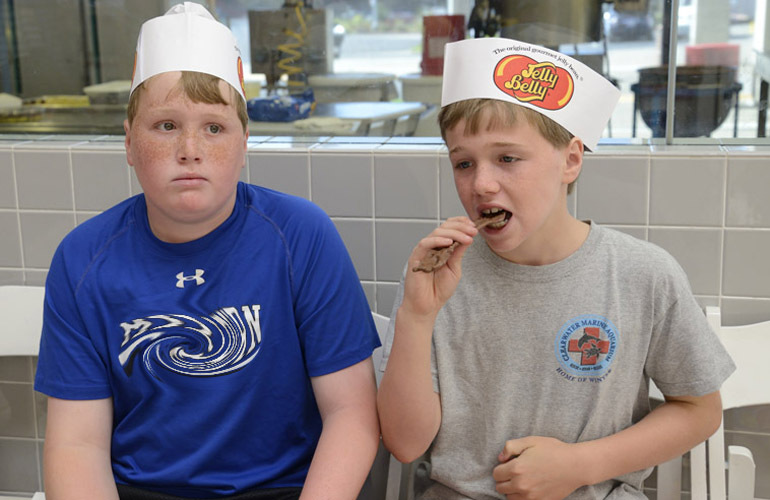 When Wendy’s husband, Tim, was in California last month with the boys, they visited the home of Jelly Belly jellybeans. Most food factory tours let you see a little of the behind-the-scenes manufacturing process, learn a bit of history, and taste the final product. 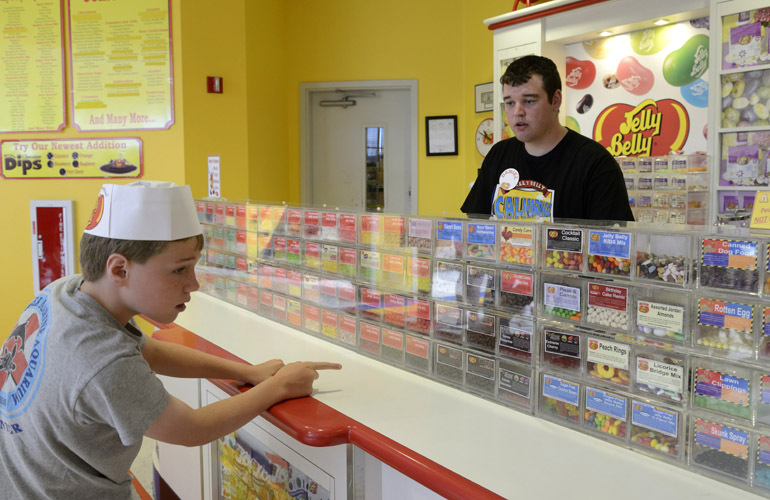 Here Tim tells us—and shows us—what it’s really like inside Jelly Belly HQ. 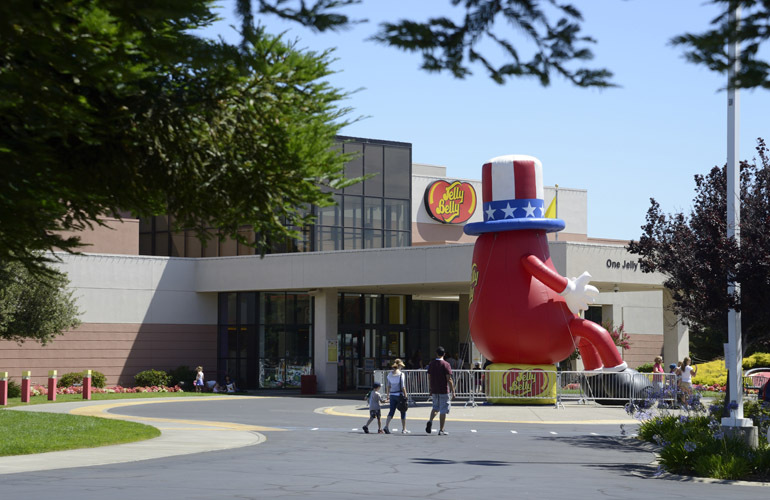 The Jelly Belly factory is just off I-80 in Fairfield, CA. Free, 40-minute tours leave from the lobby (pictured here) about every 15 to 20 minutes. Sadly no candy was being made the day we were there, but we still found the tour interesting and informative. The production of the sweet little gems was much more complex than I had imagined. Charlie was, well, like a kid in a candy shop. They give you a nice little sampler after the tour, but it never hurts to supplement it with your favorite flavors. There’s a free sampling station where you can try three choices. 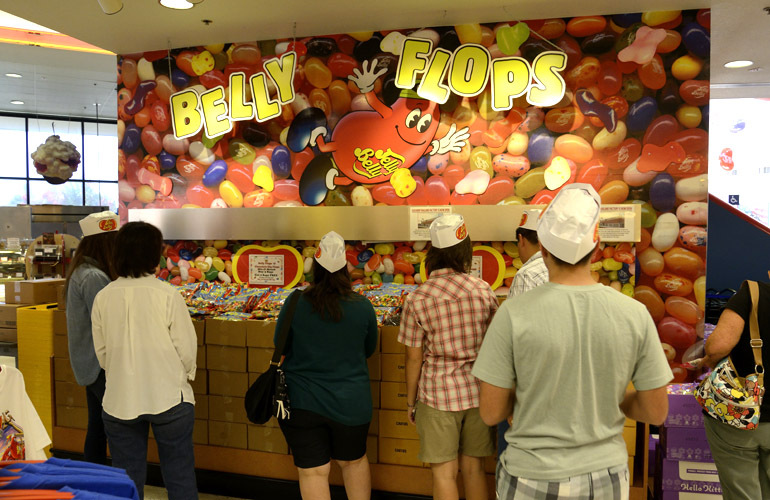 Many tours sell factory seconds at a deep discount, and Jelly Belly is no different. The perfectly named Belly Flops taste great but are weirdly shaped, stuck together or too small, and just don’t measure up to the high Jelly Belly standards. Beware! Not all Jelly Bellys are delicious. These flavors are exactly what they claim to be! 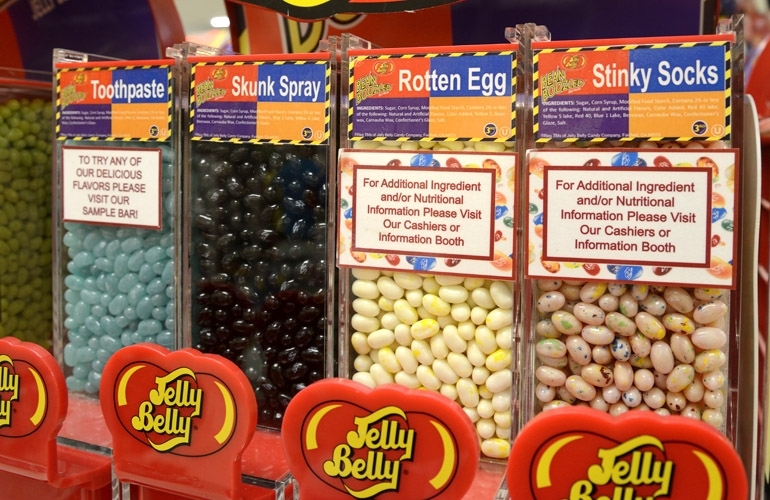 Many are used in a game sold here, called BeanBoozled, in which tasty jellybeans and downright disgusting ones are the same color. Pick wrong and you’ll regret it. If you’re feeling adventurous, try the special assortment of Harry Potter Bertie Bott’s Every Flavour Beans, with a mix of vomit, sausage, earwax, dirt and soap among others. You may never enjoy a licorice jellybean again for fear it might be skunk spray. You are warned! You’ll find plenty of parking at the main entrance at One Jelly Belly Lane in Fairfield, California. 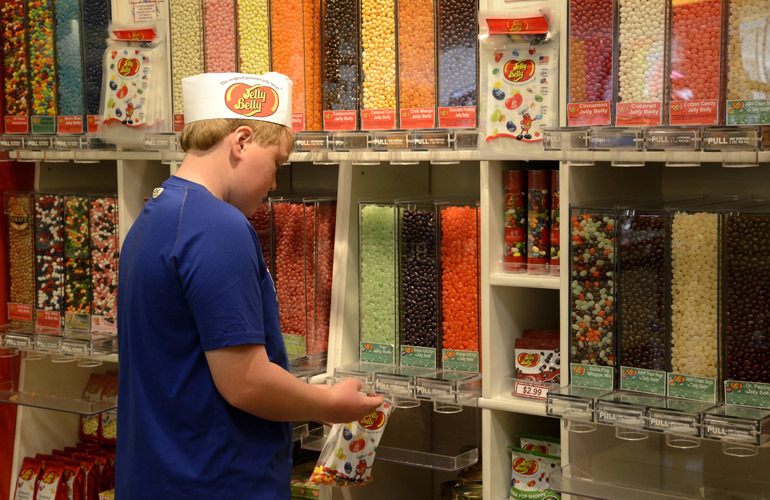 ATTENTION, DADS: Anheuser-Busch is about a mile from Jelly Belly and offers tours of its own. Must be 21. 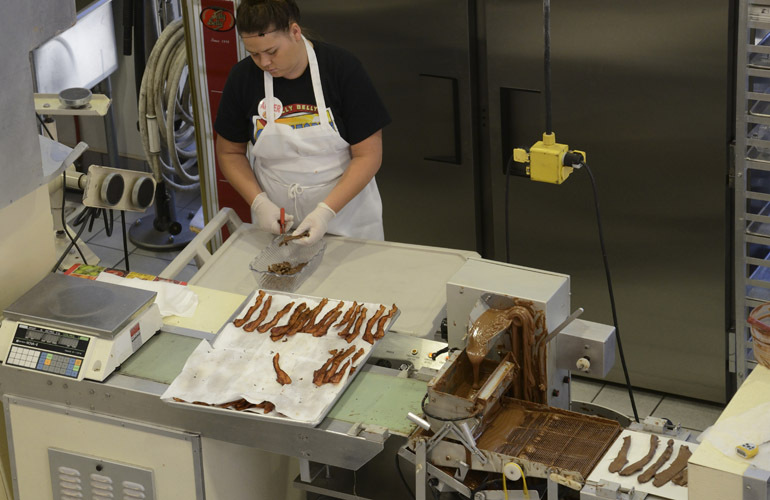 A chocolate shop in the lobby makes chocolate-covered bacon. Charlie and Doug love bacon and they love chocolate, so this should be a no-brainer. 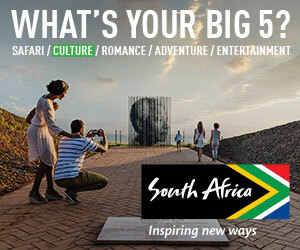 What great family activities have you found on your own trips? 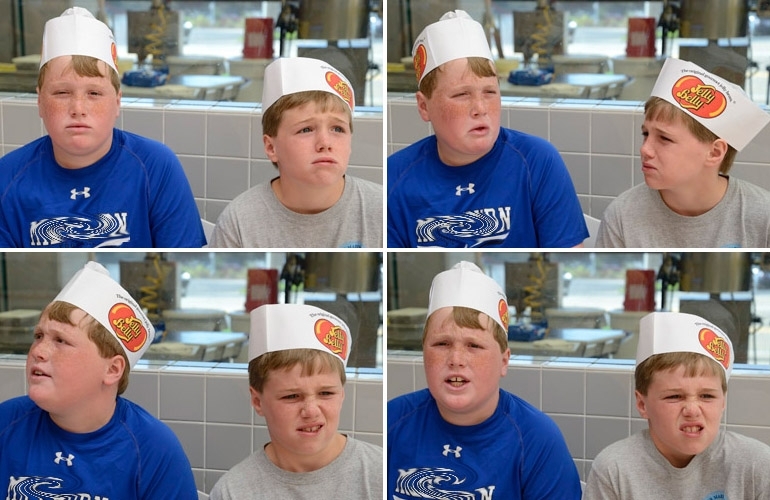 Oh my gosh…I love their faces! My son tried bacon flavored gum. Same verdict…yuck!